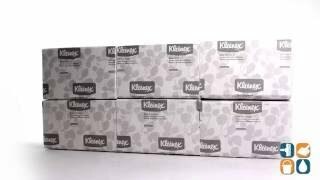 These Kleenex towels meet EPA standards with a minimum of 40% post-consumer waste. These soft and absorbent 1-ply paper hand towels are 9.2" x 9.4" in size. Environmentally conscious and a great economical alternative to the more expensive name brands, Kleenex's high-quality folded towels are thicker, stronger and more absorbent, so you use less. These one-ply paper towels will fit into any standard folded towel dispenser. White. Includes 16 packs of 150 towels.